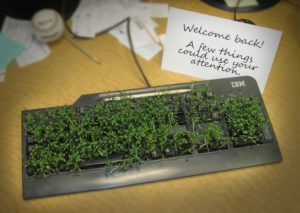 After seeing examples of a keyboard plant prank online I decided to take a shot at it myself. I documented the week long process and chose to share the results on DIY Community website called Instructables.com. This gag amused my coworker and went on to generate 48K views and 300+ favorites online. This simple exercise served to prove that with a little extra effort even the smallest ideas can reach a big audience.